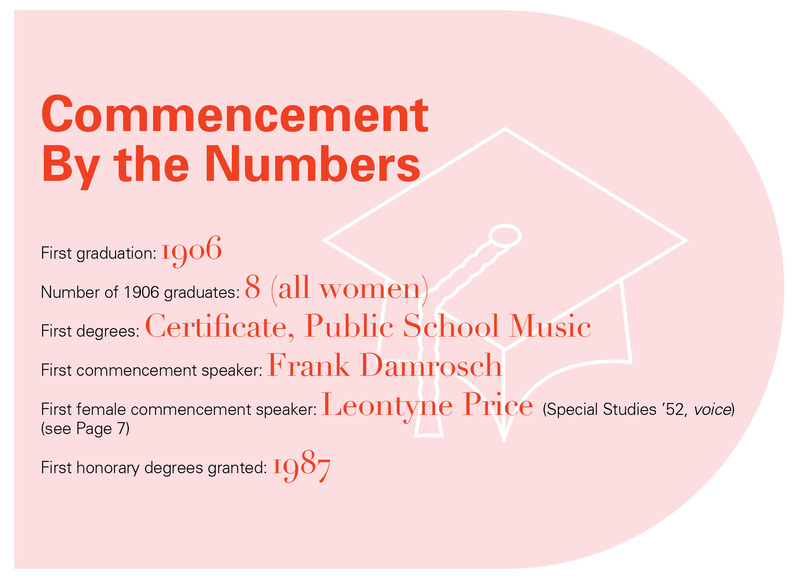 Juilliard's 112th commencement took place May 19, 2017. As they were preparing for final recitals and exams and performances and auditions, we asked some of this year's nearly 270 graduates to take a moment to reminisce about their time at Juilliard and look ahead to what's next. Realization: Juilliard amounts to what you make of it, and as a young artist, you have to take responsibility for what you take away from your time here. As someone once told me, you have to be the C.E.O. of your own company. What's next: This summer I'll be singing the title role in Cenerentola with the Merola Opera Program in San Francisco. Biggest accomplishment: It's been absolutely surreal getting to play with the Philadelphia Orchestra for much of this year. Listening to the Philadelphia Orchestra during my two summers in Saratoga Springs as a teenager was one of the major influences in my decision to become a musician. Surprises: I was a little concerned about the competitive dynamic at Juilliard, but all of the rumors could not have been further from the truth. Later on I realized that all of the people who warned me about the school had only heard of Juilliard in movies. What's next: I'm very excited to start as associate principal bass of the Toronto Symphony, most likely at the start of next season. Highlight: Without a doubt, the friendships I've formed here—especially with my dance classmates—have been the most important part of my Juilliard experience. While they make it so hard to say goodbye to this home we've built together for the past four years, I am certain that they will go on to change this world. I can't wait to see how they shine beyond these walls. Highlight: Juilliard's faculty and staff genuinely care about the well-being of each student and I appreciate all of the guidance and support they have given me. They've encouraged me to step outside of my comfort zone while remaining true to myself as a person and an artist. What's next: My plans include holding the festival manager position at the Music Mountain Chamber Music Summer Festival in Connecticut. I learned about arts management at Juilliard and it's something I'm very much interested in for the future. Uniquely Juilliard: Nowhere else could I have done what we do on a daily basis here. The amount of focus and time spent on a repertoire and practice that is still, for all intents and purposes, thoroughly misunderstood or unknown in the U.S., is staggering. All the work I've done in the Historical Performance department has left me secure with the knowledge that this is all I could ever imagine doing with my life. Highlights: The large-scale projects and travel opportunities I've been a part of, being able to lead large operas and orchestral projects with some of the greatest personalities in early music, and becoming close friends with them in the process, has been incredible. In this last year, I've been to the Netherlands, India, and New Zealand; these trips were life-changing and also fantastic from a cultural standpoint. Surprises: I always get the question, “Is it like Whiplash?” Yes, things get competitive and stressful, but that's the nature of throwing some of the most intelligent, talented, and hardworking people into a building and having them collaborate to create amazing art. People support each other, and help when things are tough. You will absolutely be pushed to your limits in your time here, but you'll come out a better artist than you could have ever imagined. Les Arts Florissants, for multiple projects. Highlight: My first orchestra concert at Juilliard! When I was a child, I went to a Los Angeles Philharmonic concert and was impressed by the conductor, Keri-Lynn Wilson (BM '88, MM '90, ﬂute; MM '93, orchestral conducting). When I realized that she majored in flute, I knew what I wanted to do: become a flutist. I still can't believe how it could be possible, but I played my first Juilliard Orchestra concert with Keri-Lynn Wilson conducting! What's next: After graduation, I'm participating in the Kobe International Flute Competition, which is one of the biggest competitions for flutists. I'm very excited and looking forward to it. Surprises: My time at Juilliard has been different from any other education I'd ever received. I studied engineering in undergrad and law after that. Both degree programs primarily exercised only one type of intelligence, and it wasn't until I came to Juilliard that my entire being—mind, body, voice, and soul—was a part of the exploration. It has been my most challenging and most rewarding educational experience so far. I was not surprised by the generosity of the people who make up the Drama Division because that spirit of love and generosity is evident at the interested-student days, throughout the application process, and during callback weekend. You feel welcomed before you're admitted. But I was surprised by their capacity to sustain that generosity. It's there at 11pm at the end of a long day and there again at 9am the next morning. It's there when you do something right, when you do something wrong, during the foulest weather, on a Saturday. I'm in awe of the ability of the Drama Division administration and faculty to show up 100 percent of the time with 100 percent of themselves for each of us as individuals. Uniquely Juilliard: The amount of information provided for us in addition to the artistic and academic coursework is so vast, whether it's workshops relating to self-development and marketing or discussions about politics and controversial topics. It's so important for us as musicians and artists to be constantly aware of and be involved with the concerns of the general public. After all, we're vessels for the arts, and in order to reach our audience, we have to be on the same ground. Highlights: Definitely my lessons with my teacher, Robert McDonald—he's such an inspiration both musically and personally. Also, it's unbelievable how much talent resides in this building, and I wish I'd explored more of the other divisions outside of music. I just started watching the dancers perform this year. What's next: Taking a psychology class at Columbia reinvigorated my passion in science, so I'm enrolling in a post-baccalaureate pre-med program in the coming school year. However I will still be playing the piano—I'll be making my recital debut in Weill Recital Hall at Carnegie Hall in September, which I'm very excited for! Highlight: A big one was traveling to the Cayman Islands with a group of jazz students this year. It was an amazing opportunity not only to get to travel and perform with classmates and professor Helen Sung, but also to teach in the community. We worked with local junior high students, and getting to interact with them and expose them to jazz was inspiring. The music curriculum is pretty limited at their school, so the kids were fascinated. What's next: Staying in the city and working in the jazz scene, plus traveling a bit this summer for some gigs. Highlights: One has to be the chamber music I was involved with throughout this school year. School chamber situations are frequently unpredictable when you are a new student, but things become a lot more clear once you get to meet other students and familiarize yourself with the playing around you. Surprises: There's a misconception about students here being unapproachable, but while everyone is focused and goal-oriented, there are definitely more genuine and kind peers than one might expect from the stereotype. Biggest accomplishment: Mostly the fact that I survived! Seriously, though, I achieved even more than I wanted to here at Juilliard, but also in general in the U.S. I accomplished my educational goals. I solved many technical problems with my wonderful teacher Edith Wiens. I have made many great friends. I've learned so much and prepared so much repertoire that I feel totally ready to graduate and go into the world and present my artistry and share my interpretations. Highlight: Definitely long rehearsals and long talks afterward with my pianist and best friend, (graduating collaborative pianist) Michał. Once I was very sick but we had to rehearse, so I was just speaking my words and Michał started to sing my part, and it was super funny hearing him sing so high. What's next: Singing the role of Orimeno in Cavalli's L'Erismena at the Aix-en-Provence Festival in July. Highlight: It's difficult to pinpoint just one, but performing Mendelssohn's Violin Concerto in D Minor in Alice Tully after winning the Historical Performance concerto competition would be one. Under the direction of the inspiring Monica Huggett and with my best friends there in the orchestra, I felt like I could do anything and perform far beyond my limits. Uniquely Juilliard: The sheer amount of concerts and performances has been one of the most important aspects of my education—during these two years, I've completely forgotten what it is like to be nervous or feel discomfort on stage. Because of Juilliard, I feel prepared to go out and play no matter what, which is very liberating and exciting. Surprises: How friendly the environment is! During my first month at Juilliard—we had all basically just met—my chamber music ensemble was rehearsing trio sonatas and at one point we started laughing without end simply because of an extensive ornament gone awry. That kind of genuine and joyful musicmaking is what it's all about! Realization: I'm looking forward to graduation in terms of taking the next step in my career, but it's bittersweet. My two years at Juilliard have been filled with unforgettable experiences, exciting concerts—and adrenaline!—and some of the best friends and colleagues I've known. What's next: Moving to France and performing with William Christie's orchestra Les Arts Florissants, but I plan to keep a base in New York and visit my friends and teachers at Juilliard whenever I'm here. Realization: It's so important to know that no one can bring to the table what you can. This is a very difficult thing to come to terms with in a school setting when you are directly competing with your classmates for performance opportunities. It can be easy to assume you aren't as talented as your peer who got the role or won the concerto competition, but it's important to trust in yourself and your individuality and realize that you have other things to offer that will be valued and coveted. There are operas, orchestras, plays, and shows that will need your special talents and your individuality, and they will find you. Don't be discouraged if you don't get as many performance opportunities at Juilliard as you hoped for. It's an opportunity to practice your hardest and perfect your skills so when it's time to leave, you'll know yourself and what you have to offer so well that you'll be able to show it to the world without hesitation. What's next: Singing Susanna in Le Nozze di Figaro at Chile's Teatro Municipal de Santiago in June and then joining the ensemble of Oper Frankfurt. Highlights: Touring with the Artist Diploma Ensemble to Japan, Brazil, and Italy was unforgettable, and working with Wynton Marsalis has been transformative. Of course, he addresses the microscopic musical details but he also emphasizes our broader responsibilities as artists and leaders as well as the cultural and social context of jazz. Uniquely Juilliard: I've hugely valued my time as a MAP, Morse, and Gluck Fellow and the pride in seeing students grow musically, especially the ones who are advancing from MAP and into Pre-College and beyond. Plus there's a special camaraderie that's cultivated at Juilliard, and the motivation is infectious. What's next: In addition to touring as a sideman and working on my first record as leader, I'm working on an educational project that aims to bring Juilliard- and Jazz at Lincoln Center-style teaching to Europe. After four years at Juilliard and as a MAP, Morse, and Gluck Fellow I feel empowered and equipped as an educator as well as a musician.